- a 341 ml bottle of beer having 5% alcohol content cannot be sold for less than $1.08 (including taxes). - a 750 ml bottle of vodka, whisky, gin, rum, or tequila cannot be sold for less than $22.80 (including taxes). - a 750 ml bottle of liqueur cannot be sold for less than $15.35 (including taxes). The minimum price laws nullify the price-reducing effects of fair competition. The result is that consumers are needlessly forced to buy wine, beer, and spirits at artificially high prices. Prior to 1916, beer, wine and spirits could be purchased at privately-owned stores in Ontario. In 1916 the Conservative government imposed liquor prohibition in Ontario. In 1927, the Conservatives replaced prohibition with a government monopoly on the retail sale of alcoholic beverages. It also instituted heavy-handed regulations, including regulations banning singing, and banning unmarried men from sitting with women, in bars. The repeal of many of the more outrageous government activities in alcohol - such as spying and keeping lists of known drunkards - took decades. Today's Liquor Control Act and Liquor Licence Act retain many of their old, backward, 20th century aspects. Among the worst is that the law currently continues to impose two monopolies with respect to alcoholic beverages. Under our current laws, you can buy liquor only from a government store operated by the Liquor Control Board of Ontario (the "LCBO"). The government of Ontario regulates the minimum prices at which liquor and beer must be sold. Above that price, the LCBO determines the retail prices at which all liquor, wine and beer are sold (including the beer sold in The Beer Store). The government also continues to give a private company - Brewers Retail Inc. (which owns and operates "The Beer Store") - a monopoly. Brewers Retail Inc. used to be owned and operated by Canadian companies Molson Breweries and Labatt's Breweries. However, those beer companies were sold to U.S. companies. Today, Brewer's Retail Inc. is completely foreign-owned, yet the Ontario government continues to prevent any beer stores from opening in competition with The Beer Store. The result of the LCBO and Brewers Retail Inc. monopolies is: there is no price competition, and no competition related to what sorts of liquors, wines, or beers one can buy in Ontario. With no price competition, prices are kept artificially high. With the LCBO being the only liquor retailer, you cannot buy beers, wines and liquors that the LCBO does not want to stock. 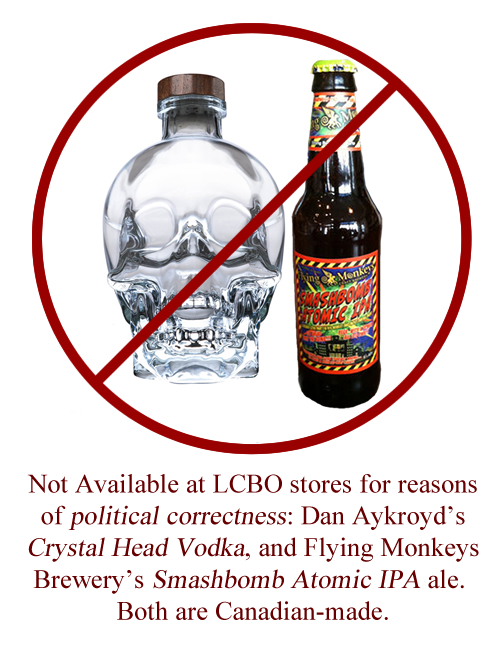 For example, the LCBO refuses to sell Canadian actor Dan Akroyd's premium "Crystal Head" vodka (which is made in Newfoundland) in its stores because the vodka comes in a bottle shaped like a clear crystal human skull. The LCBO also refuses to sell Smashbomb Atomic IPA (an ale made by Flying Monkeys Craft Brewery of Barrie, Ontario): it objected to the name and label as a matter of political correctness. 1. A Freedom government will eliminate the minimum prices placed upon beer, wine, and spirits. If you choose to buy such products, you will have more money left in your pocket to purchase other things you and your family need or want. - Ending the LCBO and Brewers Retail Inc. monopolies. If you have proof that you are 19 years of age or over, you will be able to continue buying beer at the Brewer's Retail's "Beer Store", but you will also have the option of buying it at the grocery store, or at another, competing beer, wine or liquor store. You will be able to continue buying liquor, wine, and beer at an LCBO government store, but you will also have the option of buying it a privately-owned non-LCBO store. All retailers will be free to reduce their prices, so as to compete for your business. Competition among sellers will ensure that you are not being over-charged for any alcoholic beverages you might choose to buy. Ending the LCBO and Beer Store monopolies will also increase the likelihood that, if you cannot find the product you are looking for at one store, you will be able to find it at a competitor's store. 1. Minimum Pricing of Liquor and other Pricing Matters, O. Reg. 116/10, made pursuant to the Liquor Control Act.